Fares, fees and destinations aren't the only things that vary by airline. The width of your seat, the amount of legroom and the entertainment options available can make the time, well, fly by — or make a long flight feel a lot longer. Legroom is important to many fliers. Seat pitch — the space between a point on one seat and the same point on the seat in front of it — can mean more legroom, but that is also affected by the thickness of the seat back. Most coach seats on major airlines are 17 to 18 inches wide. Seat pitch ranges from 30 to 34 inches in most cases, depending on airline and aircraft. Industry expert Terry Trippler says a lot of passengers tell him you can't beat Northwest Airlines' Airbus A330 coach section seating. "No one is more than one seat from an aisle," he said. Here's a look at how seven major U.S. carriers stack up in some comfort features for coach passengers, and the options and policies some have if you need more room. Currently, all of its coach seats are fabric, spokesman Christopher White said. The airline has replaced seat cushions and covers on some aircraft with leather, and is doing the same on most other planes, spokeswoman Michelle Mohr said. Expect fabric seats in coach. The airline offers free in-flight entertainment (pre-recorded video and audio selections and games), but earphones cost $1. Pillows and blankets are free in coach. Free meals or snacks are served in economy class on flights longer than two hours. Customers in coach are required to buy an additional seat or upgrade if they can't properly attach, buckle and wear the seatbelt, with one extension. Also, the airline says, customers must be able to remain seated with the armrests down for the entire flight, and can't encroach upon the adjacent seat. The airline has begun installing live television programming on more than 200 aircraft. It has not implemented Wi-Fi, spokeswoman Kelly Cripe said. All of the discount carrier's seats are leather. The airline doesn't charge for seat selection or for specific seats onboard. Some seats in the front and back of its planes are slightly narrower because of the shape of the fuselage, spokeswoman Beth Harbin said. The airline encourages passengers who can't fit in one seat to buy a second seat when they book their travel. The airline will refund the money for the second seat if the flight doesn't sell out. The carrier is testing Wi-Fi on some aircraft. A majority of its aircraft have fabric seats in coach, though most also have leather headrests. Spokesman Tim Smith said the seat backs on American's new planes are curved ergonomically and thinner to provide more room around the knees. For larger passengers, the airline does not always or routinely charge for an extra seat unless there are no other options, Smith said. American plans to have Wi-Fi service available on 300 planes within the next couple of years. Currently, it's on 15 aircraft. The airline has leather seats on its pre-merger Delta aircraft and will be putting leather seats on all Northwest Airlines aircraft, spokeswoman Betsy Talton said. The world's biggest airline operator has a wide array of aircraft types, and seat width and pitch vary. The width of the coach seats on the A330 that Trippler mentioned is 17.5 inches. Delta works to accommodate passengers who need extra room and seat them next to an empty seat if possible. There may be situations where they are offered an additional seat at the lowest available fare when necessary, Talton said. Delta expects to have Wi-Fi installed on 300 aircraft in the fall. 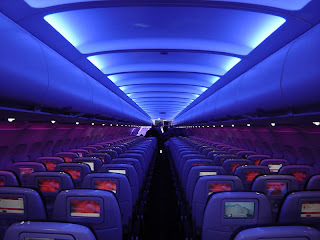 The airline has started to upgrade some seats in its coach cabins to leather, spokeswoman Robin Urbanski said. If one of its customers doesn't fit in a seat with an extended seatbelt, can't put the armrests down or infringes on a neighboring seat, United will move the passenger to another seat that is next to an empty one at no charge. 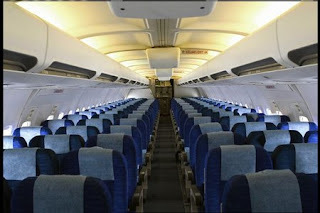 If there are no empty seats on the flight or subsequent flights, the passenger may be asked to buy a second seat to guarantee one is available. United doesn't have Wi-Fi available on any aircraft. When it comes to airline cabins, seats and amenities, Virgin American is the big winner. With leather seats offering pitch and width larger then most legacy carriers and some of the best amenities in the business. The downside is they fly to only limited destinations. There isn't a frequent flyer around who doesn't agree with the title of this post. I just got done beta testing a new frequent flyer tool that helps ff's get better seats. Unlike, SeatGuru or SeatExpert, it's an application that actually takes your preferences and will find and ultimately book you in a better airplane seat. It does this by working through your frequent flyer account, even taking advantage of your status. It's called MySeatFinder.